The earliest example of the religious services occurs in 1324 in the trial of Lady Alice Kyteler: 'In rifeling the closet of the ladie, they found a Wafer of sacramentall bread, hauing the diuels name stamped thereon in stead of Jesus Christ.' According to Boguet (1589) the Devil did not always perform the religious service himself, but mass was celebrated by a priest among his followers; this custom is found in all countries and seems to have been as common as that the Devil himself should perform the service. 2. Michaelis, Hist., p. 337. The use of this phrase suggests that the sprinkling was a fertility rite. Hutchinson had access to the same records and gives the same evidence, though even more strongly: 'Richard Carrier affirmed to the jury that he saw Mr. George Burroughs at the witch meeting at the village and saw him administer the sacrament. Mary Lacy, senr . 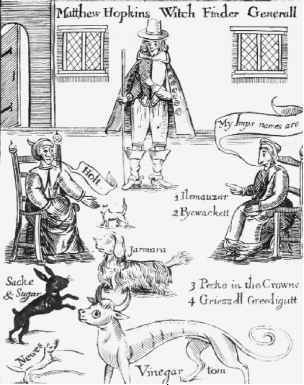 and her daughter Mary affirmed that Mr. George Burroughs was at the witch meetings with witch sacrements, and that she knows Mr. Burroughs to be of the company of witches.' John Hale has a similar record: 'This D. H. [Deliverance Hobbs] confessed she was at a Witch Meeting at Salem Village. . . . And the said G. B. preached to them, and such a Woman was their Deacon, and there they had a Sacrament.' Abigail Williams said 'that the Witches had a Sacrament that day at an house in the Village, and that they had Red Bread and Red Drink .' With the evidence before him Mather seems justified in saying that the witches had 'their Diabolical Sacraments, imitating the Baptism and the Supper of our Lord'. 3. J. Hutchinson, Hist. Of Massachusetts Bay, ii, p. 55. 5. Increase Mather, p. 210.